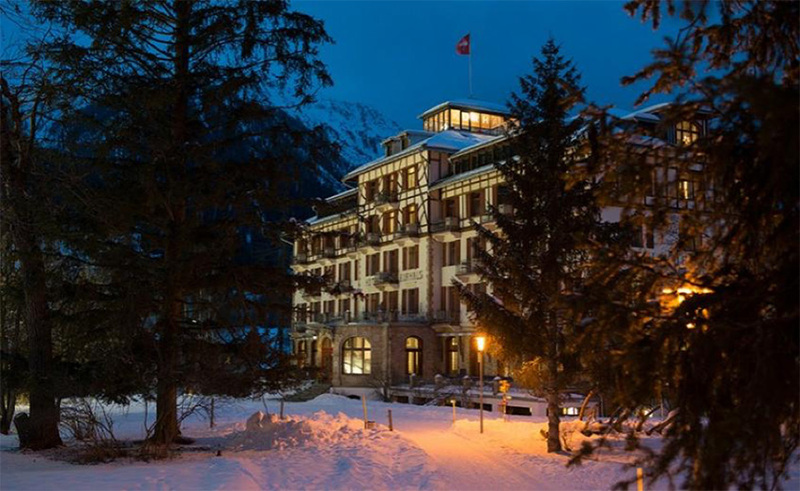 Journey through time to Kurhaus Bergün, an art nouveau gem in the pristine Albula valley. Its beginnings go back to the spring of 1906, when the grand hotel opened its doors as a health resort. Indeed, the fresh Swiss air made this wellness hotel the perfect place to recharge the batteries and detox the mind and body. It was designed by Zurich architect Jost-Franz-Huwyler-Boller, with many luxuries – central heating, electric lights, an elevator, south-facing terraces, a billiard room, reading and writing rooms and even a darkroom. Unfortunately, a fire in 1949 saw the Swiss treasure decline. Over the decades, regular guests came to love the hotel so much that a group of them bought it as a public limited company. Since then, immaculate renovation has led to a gentle-on-the-eyes balance of old and new. One of the hotel’s biggest draws is its incredible architecture. Discover a breathtaking ballroom, painted in a pale but resplendent blue, with the original windows, ceiling, wall coverings and wall chandeliers all intact. 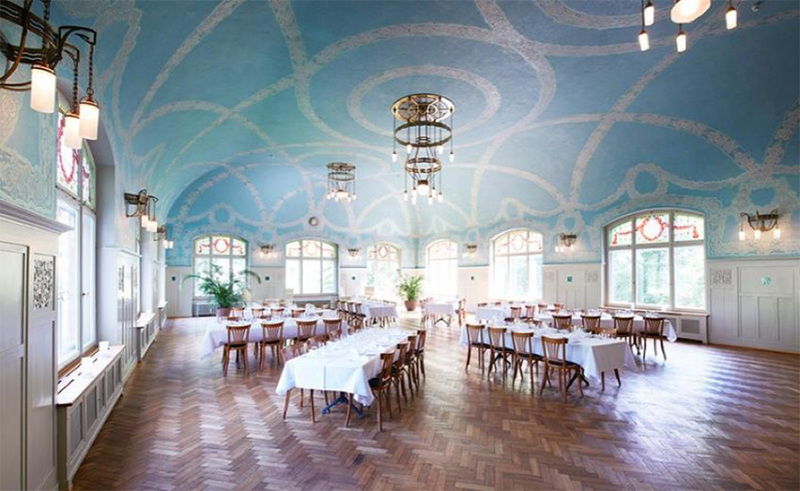 Bergün also boasts pristinely decorated lounges and the original canteen kitchen for a wonderful dose of yesteryear charm. During renovation, much of the antique furniture was discovered in the roof loft, where it had remained untouched for 500 years. The pristine renovation of this magnificent building has been duly recognised. 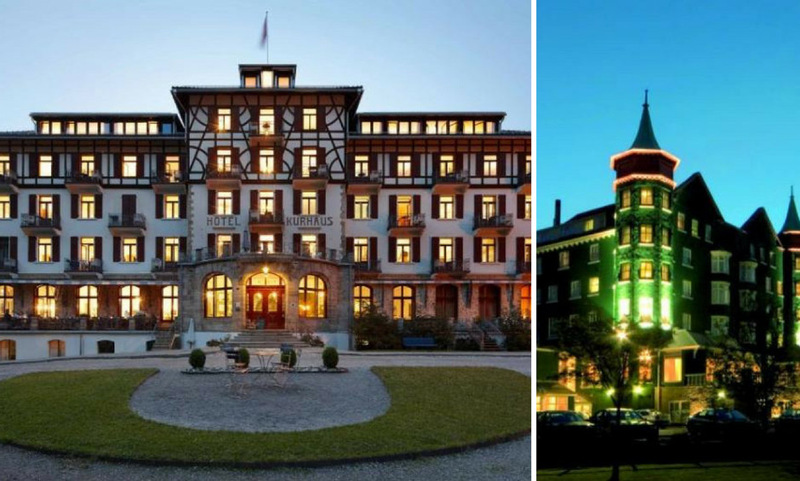 In 2007, the hotel won a special ICOMOS award for ‘the preservation and reconditioning of an extraordinary collection of lighting fixtures from the art nouveau period’’ and, following new management in 2009, it was named Historic Hotel of the Year three years later. Today, the story of Kurhaus Bergün continues. This unique property toes the perfect line between a romantic getaway and a family friendly haven, a picture drawn perfectly by recent Belgian reality TV show ‘Hotel Römantiek’. Filmed at the hotel itself, the show brought a group of elderly singletons together to find love in truly romantic settings. From swan-boat rides across serene lakes, dining in the grand hall and waking up to impossibly perfect views of the surrounding countryside every morning, the production was filled with joy. Breathe in the pure air of Mid Wales in the historic spa town of Llandrindod Wells, where a ‘grand old lady’ has attracted guests in their droves for centuries. The lady in question is the Metropole Hotel – an elegant bolthole with a fascinating story to share. The Metropole began life as Coleman’s Hotel in 1872. Shopkeeper and postmaster Edwin Coleman opened the simple but reliable family and commercial hotel, bringing vegetables from the family garden and shop in the nearby village of Howey (other shops were miles away at the time). In 1885, the Wildings bought the respected venue. John Wilding was dying, and wanted to his eight children to prosper with a stake in the spa town boom of Llandrindod Wells. The five brothers and three sisters put their all into the family business, changing the name from Colemans to The Bridge Hotel. They worked so hard, that only one of them ever married. The admirable energy and drive the Wildings channeled into the hotel resulted in a new billiard room, laundry and gracious lawns where the annual circus would perform – famously, this once resulted in a lioness escaping and wandering into the bar before being caught. A stunning veranda was also built, and guests can still savour the creamy vanilla scent of wisteria flowers which the family planted more than a century ago. 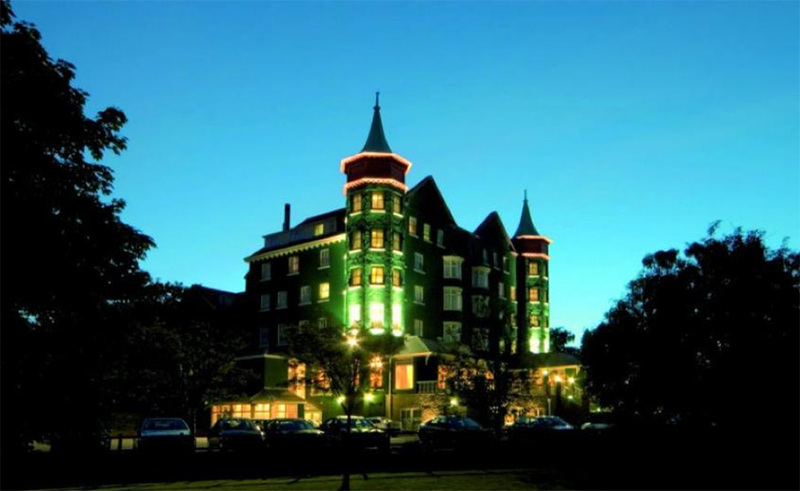 Llandrindod Wells was the place to go during the Victorian and Edwardian glory days of spa towns, and Elizabeth Mills spotted a potential in the hotel and its idyllic location. She bought it for £7,850 in 1897, beginning the life of what would become the largest hotel in Wales. Thanks to the close location to Elan Valley, known as the ‘Welsh Lake District’, and the increased demand for the clean air of Mid Wales, more and more wealthy visitors headed to the spa town. Elizabeth increased the capacity of the hotel from 40 guests to 250 by 1923, building upwards and outwards and adding a huge ballroom to the venue. Immense detail went into making sure the hotel offered outstanding Welsh hospitality. Elizabeth brought in fresh bread from a bakery every day without fail and travelled across the UK to by several carpets and huge quantities of china and cutlery. On her arrival back from such a shopping trip, her sons pointed out that all of her purchases had the initial ‘M’ on them. Her solution? She would change the name of the hotel to The Metropole. During World War 2, the Army requisitioned The Metropole, using it as an officers’ cadet training centre. Despite the extensive renovation works required after the Depression, the Mills family were undeterred. Elizabeth’s grandson David Baird-Murray took over the legendary venue in 1954, modernising the rooms with en-suite bathrooms. Although the famous spa closed in 1972, David’s son and daughter Justin Baird-Murray and Sarah Hill have invested £5m into a state-of-the-art Rock Spa, boasting sybaritic saunas and jacuzzis, cocooning indoor pools and bespoke treatments in the stunning Victorian-style conservatory. Spencer’s bar and brasserie opposite has been revamped, combining old portraits, high ceilings and 19th century charm with clean contemporary spaces and bistro food. 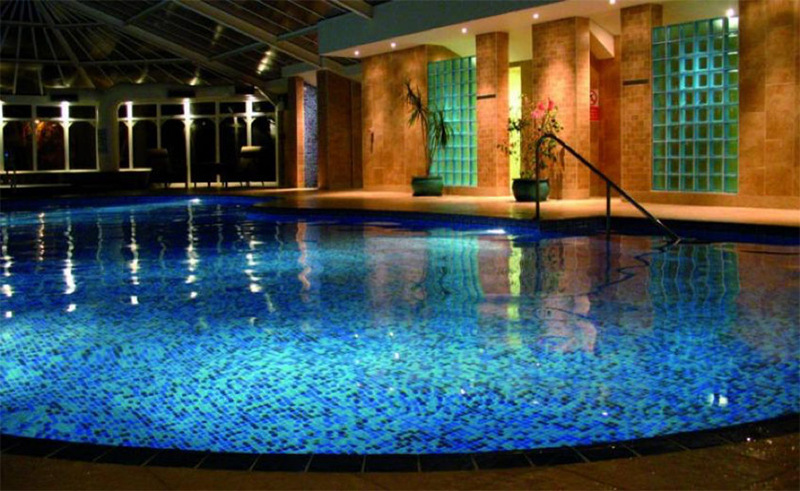 Just as they have done for 120 years, the Mills family remain your welcoming host, inviting you into a Welsh gem that’s gone full circle as a glorious spa haven. 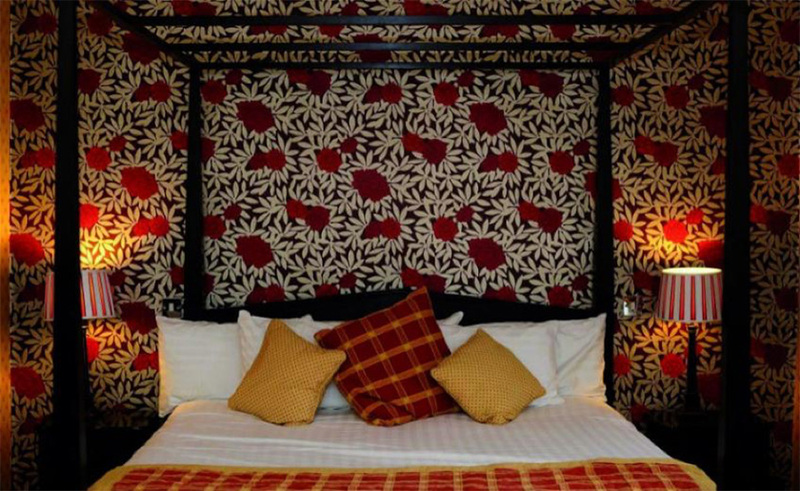 Experience a unique blend of old and new influences, modern bedrooms and a picture-perfect location when you book a night in the highest-rated hotel in Mid Wales.